Product is picked into a License Plate controlled entity such as a tote, bin, or cart. The Packer will sign into the Pack screen. To initiate the packing process, the packer will scan either the Tote License Plate, or the Shipment ID. Customer / Shipment information will be displayed in the header block. Any RF Notes that exist for the Shipment will be displayed in the Notes section. Items that have quantity remaining to be packed will be displayed on the Open Line tab. The All Lines tab will display all packable Items and quantities for the Shipment. The New Container dialog will be displayed to the user. Based on the Packing Profile, the Container ID will be automatically generated, or the packer will be required to scan a pre-printed Container ID license plate. The default Container Type from the Packing Profile will be displayed, allowing the user to drop down and select a different Container Type. To pack product, the packer will scan an Item Number, UPC, or Item barcode in the Pack Item section. The quantity will default to a value of 1 for the item’s inventory unit of measure. As product is packed, the Qty Packed and Qty Remaining columns will be updated for the Item. Completely packed lines will be removed from the Open Lines tab, these may be viewed on the All Lines tab at any time. Once a Container has been completely packed, it may be Closed by using the Close Container button from the Pack screen. The Close Container process may be performed as part of the packing process, or as a separate function at a stand-alone shipping station. When closing containers at the Pack screen you also have the option to manifest entire shipments instead of individual containers based on the associated close container profile’s Manifest at setting. This is necessary when taking advantage of large order discounts provided by third party shipping. The Close Container process marks the Container as complete preventing any additional product from being packed into the container. This process also moves the container and inventory to the final shipping location and Picks the inventory to the order in AX. The weight of the Container may be calculated or captured during the Close Container process. 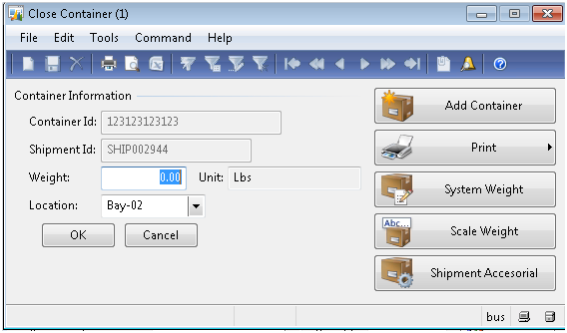 Using the System Weight option, the container weight will be calculated based on the tare weight for the Container Type and the item weights for the product packed into the container. For actual weight, a scale may be integrated with the system to capture the actual weight for the container. Throughout the distribution process, outbound Shipments may be monitored and maintained at any point along the way by using the Shipment and Load screens. Typically one or more Shipments will be combined to form a Load. A Load represents an outbound entity such as a carrier trailer or an export container. Once a Load / Shipment is released through the Wave process, they will progress through the defined workflow which may involve such activities as Picking, Packing, Staging, Loading, etc. Ultimately the Load / Shipment will reach the shipping dock, and loaded onto a trailer / container for shipping. The final step in warehousing for AX to indicate that a Load / Shipment is complete and departed the facility, is the Ship Confirmation process. Once a Load / Shipment has been Ship Confirmed, it is ready for invoicing and can no longer be maintained. To view active Loads or Shipments, utilize the Loads and/or Shipments Place. Several pre-filters have been defined to allow quick access to Loads/Shipment in different statuses as they move through their respective workflows. Upon arrival of the carrier to pick up the load, the carrier driver may be assigned a dock door to pull into for loading. Loading locations are assigned at the Load level and referred to as the Final Shipping Location. 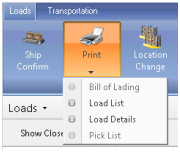 To assign a Final Shipping Location to the Load, select the Load and use the Location Change option. Using the New Location drop downs, select the appropriate Final Shipping Location for the Load. Once assigned, all RF Loading activities will be directed to the Assigned Final Shipping Location for confirmation. At any point along the processing of a Load / Shipment, several documents may be printed to facilitate the operation. 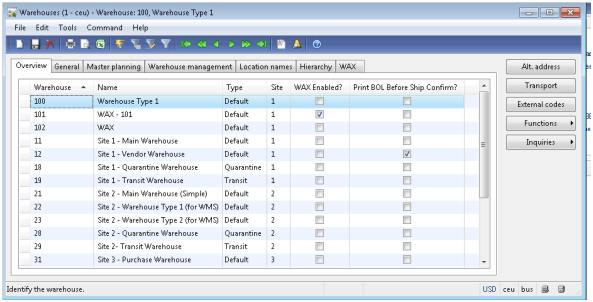 The ability to control printing of the Bill of Lading prior to Ship Confirmation is controlled by a parameter on the Warehouse. If checked, the user will be allowed to print the Bill of Lading at any point in time once the Shipment has been created. Once the Load / Shipment has been picked up by the carrier, or has departed the facility, the Ship Confirmation process is executed. The Ship Conformation process is executed from the Loads / Shipments Place. If the Ship Confirmation is executed at the Load level, all Shipments associated with that Load will be ship confirmed. 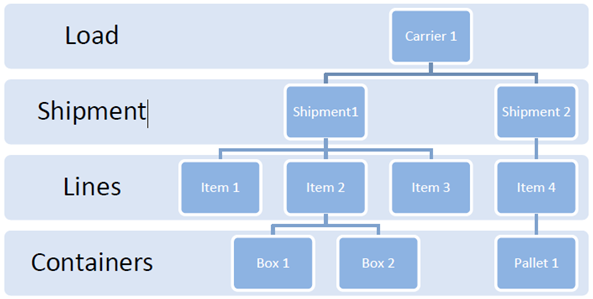 If the Ship Confirmation is executed at the Shipment level, only the selected Shipments are processed. Your specific operations workflow defined for your facility will determine which Ship Confirmation process is appropriate. Once all Shipments on the Load have been Ship Confirmed, the Load will be Ship Confirmed and the status changed to Shipped. 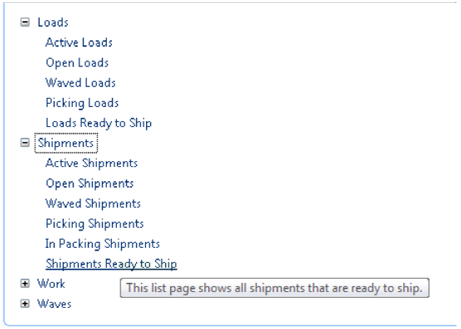 One or more Loads / Shipments may be selected and Ship Confirmed at once via the screen. 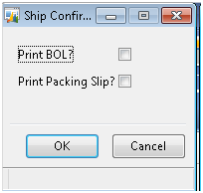 The user will be prompted to print shipping documents during the process. ASN (Advanced Ship Notice) can be sent automatically upon ship confirm. This will be determined on a customer basis by checking the Generate ASN? Field under the Customer Details. 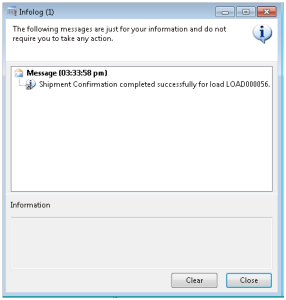 The ShipmentASNService.read service will need to be added as an action policy in an endpoint for the AIF. An info log will be returned to indicate any errors encountered, or the successful completion of the ship confirmation process. Upon successful Ship Confirmation of the Shipment, the associated Sales Order is updated accordingly by executing the base AX Post Packing Slip process. 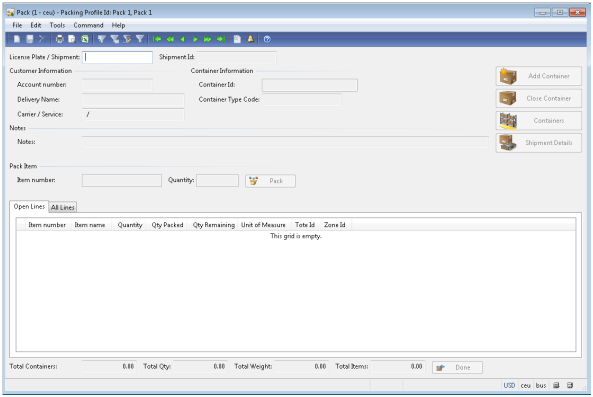 This updates the Sales Order status to Delivered, and moves the shipped quantity for the Lines to the Delivered bucket.